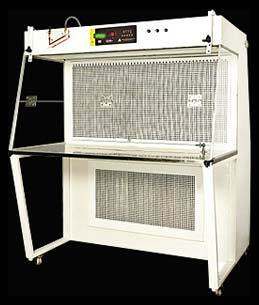 We present Horizontal Laminar Flow Bench to our esteemed customers. A wide variety of our product is available. Our product is set apart due to its features like password protection and real time clock. It also boasts an initial self cleaning cycle with programmable time. Rest assured of quality as we are very cautious about the quality of raw material. Our quality checks ensure we are doing our best in getting our valued customers the unrivaled quality. Cleanliness Level - Class 100 as per US Federal Standard 209 E.
Working Table - Made of perforated stainless steel sheet stain finished. Front Door - Made of clear perpex sheet/ polycarbonate sheet. Standard Parts - HEPA Filter, Pre Filter, Blower Assembly, Ultra Violet Lamp, Illumination. Standard Accessories - Pressure manometer, Gas inlet nozzle, floor leveling screws & wire cord. Power Supply : 220 V 50 Hz, Single Phase, AC supply. Password protection (Programmable) for authorised operation. Initial self cleaning cycle with programmable time. UV timer showing used time and balance available life in hours. Total HEPA Filter timer showing used time and balance available life in hours. HEPA filter alarm after HEPA filter life is over and guideline for further action through LCD controller. UV light/Door/Fluorescent Light Inter Lock i.e. UV switches ON only when door is closed, and automatically switches OFF fluorescent lights. If UV light is ON & the operator tries to open the door, it raises audio visual alarm. (d) Onsite Particle Counting Test with Air velocity & other tests.